Joe Crosse a fireman and plasterer from Ennistymon, who is doing a 250mile run around North Clare for the Friends of Ennistymon Hospital Photograph by John Kelly. 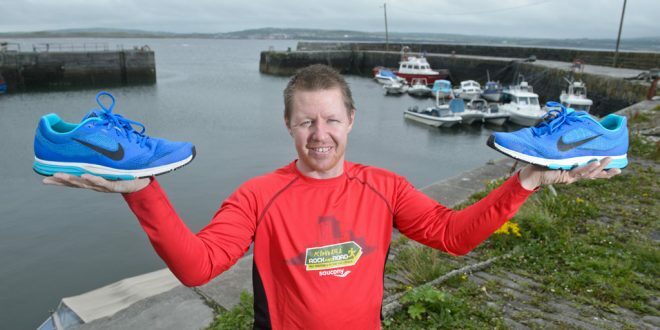 NORTH Clare part-time fireman Joe Crosse began a run of 250 miles in three days on Friday (July 29) to raise funds for Friends of Ennistymon Community Hospital. For most people, that would seem like an impossible task but Joe has form in this area. Two years ago, he ran 100 miles around County Clare in just 21 hours. Now he hopes to more than double that, as he loops around North Clare over the course of the weekend beginning on Friday morning. According to the plasterer, he is a “casual runner”. “In 2014, I did 100 miles in 21 hours. I was meant to do it in 24 but I finished in 21 hours. For the last one, I was home at Christmas time and I was bored and I was looking at possibly doing some adventure running. Then I came across 100-mile runs and thought it was interesting and wondered would I be able to do it. The playground in Lahinch was destroyed around that time, so I thought I would challenge myself and raise some money for that at the same time. That is what prompted me to do it,” he explained. He joked that for the last two years, “I have been hibernating”. “During the 100-mile run, when we were on the leg into Quilty, myself and Alan Logue were running together and we mentioned the 250-mile run and said we must do that some time. Then around Christmas, I was at home again and a bit bored and decided I would do it this year and for the hospital in Ennistymon this time,” Joe said. “Alan said he wouldn’t be in a position to do it this year because of work commitments but once I have something in my head, I have to do it then and there so that is how I ended up signed up to do this but Alan is running part of the route with me,” he added. “They are popular enough in England. I was trying to convince my brother-in-law, who is living in England, to go and do it but he wouldn’t,” he said. According to Joe, the most difficult part of the 100-mile run was not what people might expect. “The hardest part was starting off,” he revealed. “Starting off was definitely the hardest. Just before I started it, I was wondering could I do it and then once I started, all that went out the window. Thinking about it was the hardest part, then going out and doing it was not as hard as I thought it would be. People running parts of it with me and the chatting and laughing, that took my mind away from it,” he said. Like last time, Joe would love to see people giving him support along the way. “Initially, I was going to do the 250-mile cycle route but I felt I would be isolating myself from people who would do it with me. I’d love to see a few people come out and support me. I know that there are some people who are going to do parts of it with me but last time passers-by were beeping and waving at me and that was a big boost. I remember at one point there were people overtaking us and then they pulled in in front of us and got out and put money into the bucket. Stuff like that means an awful lot when you are out on the road,” he stated. “I’d love any support. There were people out at 4am at crossroads last time beeping and flashing lights and shouting me on and that was a serious boost to me, when I just wanted to be at home in bed,” he said. The 37-year-old chose to support Friends of Ennistymon Community Hospital this time around. “It is a fantastic facility to have in North Clare, not to mention in my own home town. It generates such a comfort for people all over Clare. This will hopefully be one of my last ones, so I decided to give it to an organisation at home,” he said. The route for Joe’s run will take him from the Square in Ennistymon on Friday morning at 9am. From there, he will go to Kilshanny, Lisdoonvarna and Doolin, then the Cliffs of Moher to Liscannor, Lahinch and back to Ennistymon. “He will do that 25-mile loop 10 times,” John Garrahy of Friends of Ennistymon Community Hospital explained. “The money raised will go towards enhancing the facilities at Ennistymon Community Hospital. What the Friends of Ennistymon Community Hospital are about is, in co-operation with the HSE, to improve the facilities for the residents and day care centre users. The big thing in the last five years is all the new beds. We have extended it so that there are en suites and twin bedrooms and we also bought equipment. There are 28 beds there now,” he added. “We are delighted Joe has decided to do this for Friends of Ennistymon Community Hospital and hope that people across North Clare will come out and support him and make donations if they can to this worthy cause,” John concluded. Donations can be made on Irish page of the Every Day Hero website by searching for Joe Crosse.